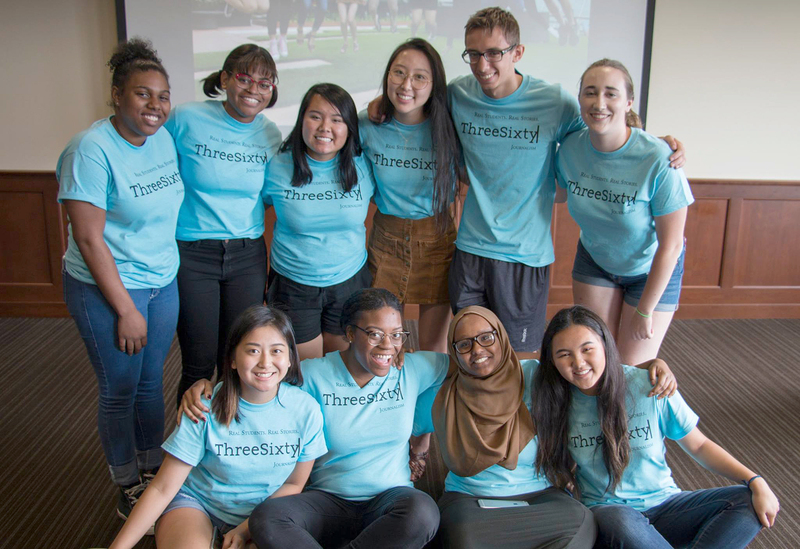 This summer, ThreeSixty Journalism debuted two brand new camps—a TV broadcast camp and a radio broadcast camp—for advanced ThreeSixty students and young alums. 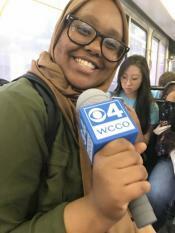 In the TV Broadcast Camp that was held from July 17-21, students created short “look-live” videos that covered health equity in the Twin Cities. The TV Broadcast Camp was a new collaboration with Blue Cross Blue Shield Center for Prevention, public relations firm Padilla and WCCO-TV. The Radio Broadcast Camp took place on July 24-28 at the Minnesota Public Radio headquarters in downtown St. Paul. 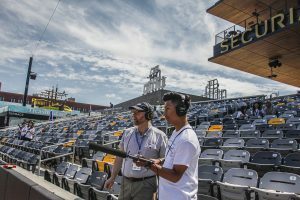 Nine advanced ThreeSixty students and young alums were guided by MPR News staff throughout the week to create two-minute “superspot” radio stories on a St. Paul Saints gameday at CHS Field. I was among the 10 advanced ThreeSixty students and young alums who attended the five-day TV Broadcast Camp on the University of St. Thomas campus. Students learned the essentials of broadcast TV—script writing, on-camera interviewing, broadcast voice, on-screen presence and smartphone videography. By the end of the week, students created 2-to-3-minute liveshots of stories revolving around the topic of health equity. These stories were posted on WCCO-TV media platforms. Amari Graham, a ThreeSixty student and incoming freshman at the University of Minnesota Duluth, and I reported on a St. Paul-based organization called Roots for the Home Team. During our 3-minute liveshot, we spoke with executive director Sue Moores and student participant Tony about how young people are growing vegetables, making salad recipes and selling those salads at Target Field during Minnesota Twins games. It was a new form of reporting for us, and we had the help of mentors from Padilla. 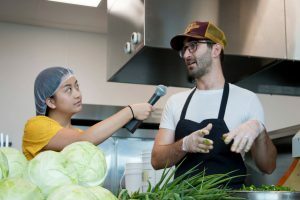 Katelyn Vue, a senior at North High School in St. Paul, and Zahra Mustafa, a junior at Eagan High School, reported about The Good Acre, a nonprofit commercial kitchen that helps food makers connect with their community. After spending a week learning about TV broadcasting, five of those same students and I continued growing our knowledge at Minnesota Public Radio headquarters the following week. Three more advanced students joined us. The Radio Broadcast Camp was instructed by experienced newsroom professionals from MPR News. In five days, students learned what makes radio different and how to interview, write and read for radio. The radio camp was held in memory of Toni Randolph, who passed away in July 2016. Randolph was the MPR News editor for new audiences and a longtime supporter of ThreeSixty Journalism. She sat on ThreeSixty’s Board of Advisors and won its 2014 Widening the Circle Award, which recognizes an individual’s extraordinary contributions to the next generation of journalists, particularly while promoting inclusion and diversity. In January, MPR News and ThreeSixty set out to establish a sustainable and purposeful project to honor Randolph’s memory. MPR newsroom staff raised more than $11,000 for the camp from coworkers, colleagues and friends. Those funds were matched by MPR, and the ThreeSixty/MPR Radio Broadcast Camp was born. 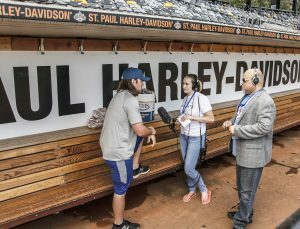 Radio camp attendee Zekriah Chaudhry, a senior at Minneapolis South High School, reported on the St. Paul Saints team manager, George Tsamis. Like many of the other students, Chaudhry valued learning from MPR News reporters during the week. “Getting to know experts in radio journalism and how they do their job was a rare experience that I don’t take for granted,” he said. 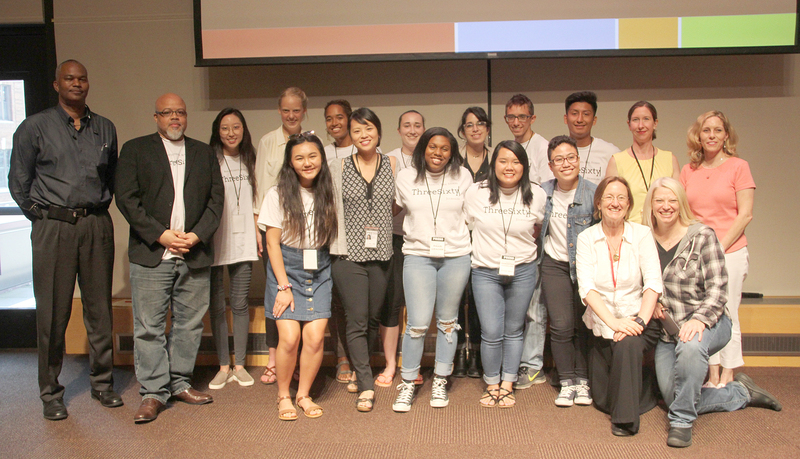 At the end of the week, a reception was held in MPR’s UBS Forum, where camp participants, parents, MPR staff, ThreeSixty board members and staff, and others gathered to hear the nine two-minute radio stories and eat ice cream. The two camps also caught the attention of several media organizations, including WCCO-TV, CCX Media, the Maple Grove Press and the Sun Sailor, all of which produced stories on ThreeSixty. It was an exciting two weeks for ThreeSixty, its students, partners and volunteers.